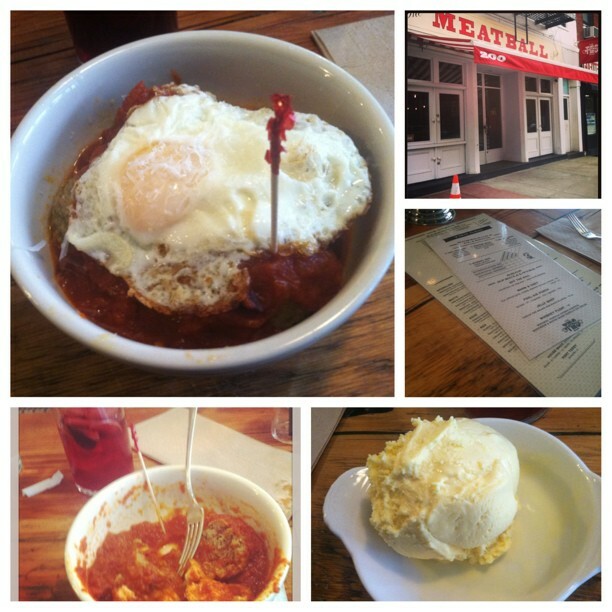 Celebrate #NationalMeatballersDay at The Meatball Shop! First, off Happy National Meatball or better yet Happy Meatballers Day! In honor of the holiday today, The Meatball Shop is asking their fans to snap and share your favorite meatball moment on Twitter and Instagram using the hashtag #NationalMeatballersDay and the handle @MEATBALLERS. The three most creative photos will be chosen and shared on our Twitter and Instagram feeds on Monday, and the winners will receive a limited edition black n’ gold Grinder Hat. HAPPY #NATIONALMEATBALLERSDAY! 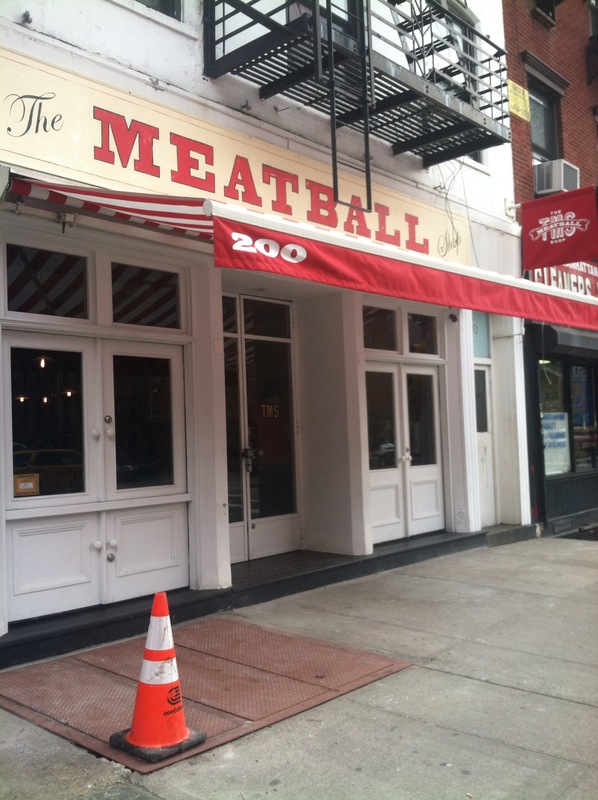 So last week, after taking a cooking class at Sur La Table in Hells Kitchen I decided to take food journey to Chelsea to check out The Meatball Shop in their new location, 200 9th Ave. It was also my first time ever dining at The Meatball Shop. I figured it was about time, since I had heard amazing things about them. I had no lunch plans that day so it was definitely worth the trip. Let me start off by saying, their meatballs are a big deal and you definitely get a bang for your buck. It was the new location’s first week doing lunch service and everything was on par. I decided since I came by myself I should sit at the bar. 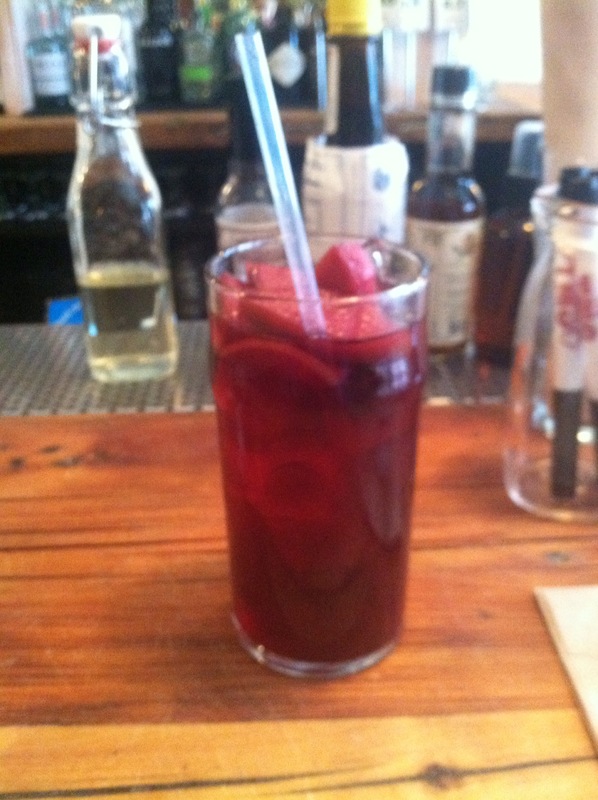 I looked at the menu and decided to start with their signature sangria, which was whopping $6– for NYC that is amazing and thus the excitement began. For my meal I decided to get the Naked Classic Beef Meatballs with Class Tomato Sauce & the Family Jewels (which is just a fried egg on top) which as only $7. The meatballs were delicious, huge, and filling so I actually had some leftovers– which didn’t last in the fridge long. The bartender I had was wonderful and recommended I try dessert so of course I did, I mean who in their right mind would say no to a $3 scoop of homemade ice cream? The ice cream of the day that day was passion fruit so I really couldn’t say no. Of course, I was very happy with my decision because it was some of the best ice cream I’ve had in the city. It was so creamy and delicious and you could really taste the fruit! If your looking to celebrate National Meatball Day in the city– I highly recommend you celebrate the right way with the @MEATBALLERS! This entry was posted in Dining NYC, New York, New York City, nyc, Restaurant Reviews, Sara Monica, SCBD, Small Chick Big Deals and tagged balls, chelsea, meatballers, meatballs, national meatball day, national meatballers day, nyc, sara monica, scbd, small chick big deals, the meatball shop, yum by smallchickbigdeals. Bookmark the permalink.